Babraham Road Traffic will increase by 15%! The GB1/GB2 Green Belt developments in Cambridge will generate an extra 1900 car journeys a day on Babraham Rd according to an independent report. Transport Report This will increase traffic on the already congested Babraham Rd by 15% – a huge increase considering traffic is already stop-start at rush hours. This will lead to even longer commutes for Cambridge’s long suffering workers. 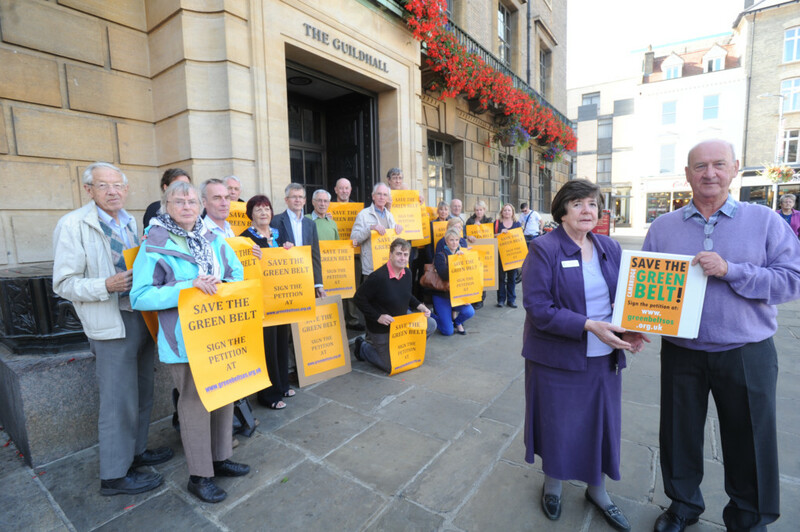 A copy of the petition was handed over to the Cambridge City Council at the Guildhall. A group of 30 Green Belt campaigners joined Peter Swallowe in handing over 2000 signatures along with a letter detailing why the Green Belt needs to be protected. For a copy of the letter to Councillor Bick see here. 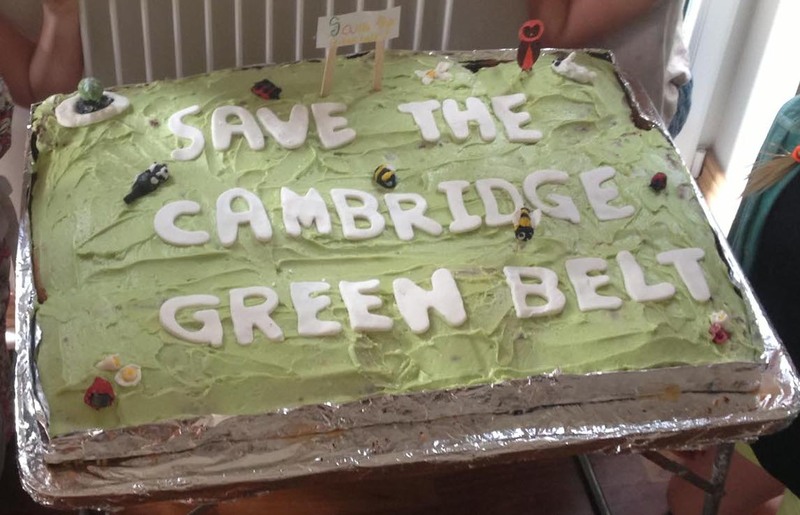 At 12:30pm on Monday 30th September the Save The Green Belt Campaign will be handing over the petition to the Cambridge City Council at the Guildhall. Supporters are welcome to attend and show their support. Save the Cambridge Greenbelt will be at the Community Groups Fair in the Cherry Hinton Village Hall. It is part of the Cherry Hinton Festival. This will be an opportunity for people to sign the petition and find out more about the Coouncils plans to build on the Green Belt. The Cake Carve Up event attracted a large crowd of people and the media to The Green in Histon who found out about the Councils’ plans whilst eating their free cake. The Carve Up of the cake resonated well with the carving of the Green Belt. The event generated 80 new signatures for the Save the Green Belt petition and many people took the Save the Green Belt flyers to display in their windows. HAIVAG also used the event to direct people towards the SCDC road show taking place at the Histon and Impington Recreation Ground 2.30 – 7.30 pm on Thursday 5th September and to highlight the planning consultation currently being held by South Cambs District Council and the City Council. Local charity Cambridge Past, Present & Future (Cambridge PPF) continues to question the necessity for the release of yet more Green Belt land for development, arguing that Local Authorities have so far failed to make a compelling case. In the context of the total housing target for the Cambridge sub-region – some 35,000 new homes up to 2031 – the additional 1,000 new properties proposed for Green Belt sites could be assimilated elsewhere in the City and South Cambs. Although it believes the Green Belt cannot be regarded as sacrosanct, Cambridge PPF feels that releasing more land from the Green Belt should be the option of last resort. The charity feels that, during the 18 years of the plan period, potential sites within the urban area may well come forward that might benefit from regeneration or from re-development and that these should be properly explored before Green Belt land is taken. It must be clear that the Green Belt sites will only be brought into consideration, if at all, when other sites have been developed. If ‘easy options’ are available on Green Belt land, they will reduce the likelihood of more appropriate but ‘difficult’ sites in the City being tackled. Cambridge PPF also questions the basis for the split in the housing targets between the City and SCDC. Development land in the city is highly restricted but possible sites for housing are available in the surrounding South Cambs area. A modest shift in the split would remove the need by the City Council to take more Green Belt land. In addition, the County Transport Strategy proposes rapid transport links along all major corridors into Cambridge, yet the contribution that the nearby Market Towns might make to the housing target for the Cambridge Sub-Region is underplayed in the current thinking.